Got a thirst for a new challenge? Short on time but lots of will power? What: To drink only water throughout March. Nothing. Else. Who: Anyone, Any Age, Anywhere! CHALLENGE ACCEPTED – SIGN ME UP! Water is life. A right everyone should enjoy. The 22nd March represents World Water Day. 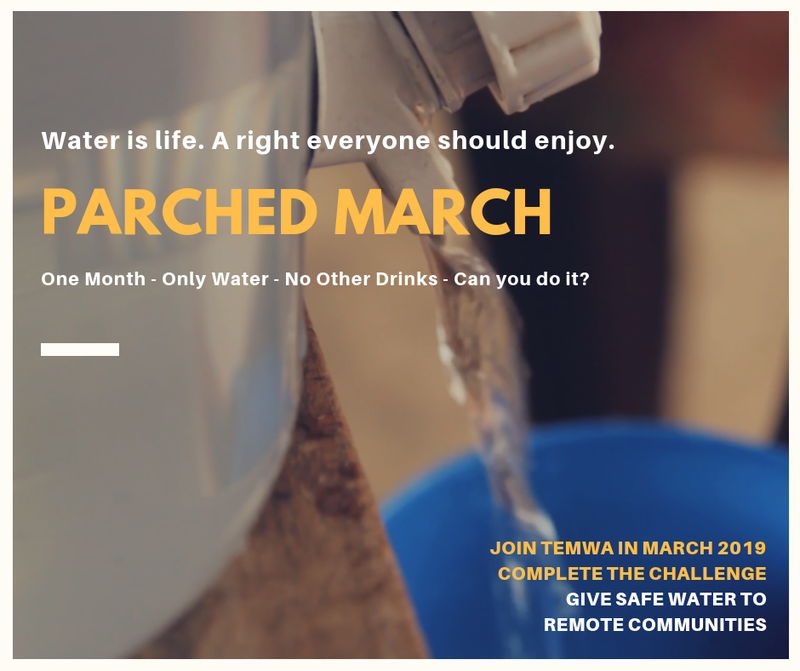 So, we challenge you to take on the Parched March and drink only water for one month (1st-31st March) to enable others to access clean water. That’s right, no coffee, no tea, no juice, no alcohol…just WATER! Not going to make it? Be part of the campaign by donating directly to give child access to safe water. In the UK, we are spoilt for choice when it comes to quenching our thirst. From fizzy drinks, to herbal teas, to hot chocolates with marshmallows and cream, to lattes with a vanilla shot; choosing becomes tricky! But in northern Malawi, many families have to resort to drinking and washing in dirty water. This water often leads to preventable illnesses such as Diarrhoea, bilharzia and Cholera, which can be deadly if left untreated. Limited access to healthcare in the remote villages means many go untreated. To overcome this, Temwa works with communities in Malawi to train the residents in water and sanitation and distribute water filters to families, through the support of organisations like the Zurich Community Trust. These simple filters get rid of the nasties, not just saving lives but helping transform them. With clean water, children don’t miss school through sickness and parents are able to earn more for the family. See the impact this project is having already.. Through your fundraising, together we can provide clean water to even more communities and reach our goal of giving 200 people clean water. Every £5 you raise gives someone access to clean water for at least three years. Not only will you feel great for helping make a difference, so will your body. Drinking plenty of water can help you feel more energetic, improve your concentration, support healthy skin and hair…plus think of all the money you’ll be saving by skipping that daily flat white! We’ll provide you with Parched March guidance, top tips for fundraising and one-to-one support to help you reach your goal. You can start fundraising by setting up your Virgin Money Giving fundraising page – it’s easy, it’s free and takes care of the Gift Aid, boosting each donation! Of course, we’d love to see your #ParchedMarchDiary – share your videos, photos and blog updates online to raise awareness and encourage more sponsors! Follow Temwa on Facebook, Instagram and Twitter. You can tag us in your social media posts using @TemwaUK. And make sure to use the hashtag #TeamTemwa and #ParchedMarchDiary so we can follow your story.